Every so often someone, somewhere proposes a constitutional amendment requiring laws to be as simple as possible, and as short as possible. It’s part of the long tradition of suspicion towards bureaucracy. 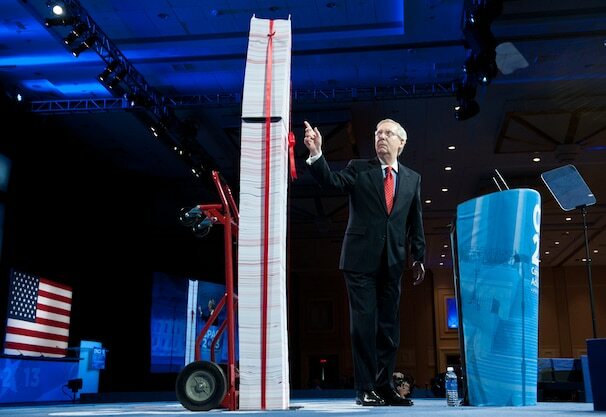 Why is the budget the size of three phone books? Why can’t Congress just get down to the core of it? Tea Party groups and other small-government conservatives often take hardline stances towards making government more common sense, often by taking a howitzer to the various agencies that seem to make stuff complicated. Each Republican presidential primary is a smorgasbord of tax plans, each aimed at hacking the IRS down to a skeleton crew. The issue is that government of any size is incredibly complex. Any large institution is- look at the metric tons of paperwork produced by a sizable corporation. Large bills like the Affordable Care Act are not the norm, but they are common. Over three hundred million people live in the United States, who then interact with everyone else on Earth. Even the simplest ideas, those common sense two page proposals, will gain weight as it is connected into the legal system. Ultimately the task state and federal governments have is not to make their laws briefer or in much simpler language, but making the scope and purpose of a law coherent. Most of a long bill’s paperwork, or tax regulation, is the legal machine code created by a dedicated battalion of lawyers. The specifics of those U.S. code alterations are not important, rather the public needs to grasp what their practical effect will be, and what principle is guiding their use. Doing the paper stunt, where politicians show how giant a given bill can be, is just that- a stunt. Many ideologies attempt to simplify society, but society refuses easy guidelines. It is monstrously complicated because people are different in a million tiny little ways. I expect solutions to societal problems will be complicated. They just need to be sufficiently graspable.